We let you taste an abundance of delicacies processed into the most delicious ice cream or a “pieleke kaat” like they sometimes say in Sint-Niklaas. Our mission as threefold winner of the Hospitality Awards “Best ice cream shop of Belgium” is to produce an ice cream of top quality: pure tastes and a fine texture, with a hint of creativity! Breath in the atmosphere of our craft. Already 87 years, we are one of the few ice cream shops in Belgium who pasteurize their raw whole milk themselves in an open workplace. All refined sundaes are made in an open kitchen. A real spectacle for the eye and a true taste sensation. Daily preperation: our ice cream is fresh and home-made. No preservatives or dyes are used. With respect to the health and the origin of the natural product. The assortment varies: some flavors are available every day, others depend on the season. There’s always something new to try out! Every day 9 fresh ice cream flavors. With the best and sometimes rather expensive ingredients: natural and tasteful. Sometimes fresh, sometimes deep-fried, but always the absolute best! Green Sicilian pistachios from Bronte, hazelnuts from Piemonte. In the traditional way: from raw material to a high quality finished product, following the well-known Flemish recipe from mr. François since 1928. Other ice cream products: we also have sorbets, ice lollies, ice cream pralines, pancakes, sundaes,… Dare to choose differently! It’s also possible to rent our filles up ice cream cars or to organize a large event with up to 1000 visitors with our retro ice cream truck. Real eye catchers. If you want to know more about us you can follow us on facebook. But most preferably, we would like to see you in the best ice cream shop of Belgium! 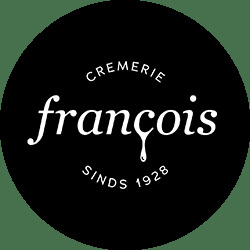 Come and enjoy a delicious sundae with your family or friends and be surprised by the wonderful world of the ice cream makers from Cremerie François.